Do You Have Clear Boundaries For Your Business? Boundaries are what keep things in order and flowing smoothly. They set the terms and conditions … the expectations between two or more parties. In a relationship, boundaries are what set the space between where you end and the other person begins. In a business, they set the space between your business and the client — specifically to determine what you will and will not do, when you are available, turnaround time for projects or services, things of that nature. Be clear and concise when discussing boundaries and expectations with prospective clients. Establishing them in the beginning will prevent surprises and misunderstandings in the future. Be clear and concise when discussing boundaries and expectations with prospective clients. 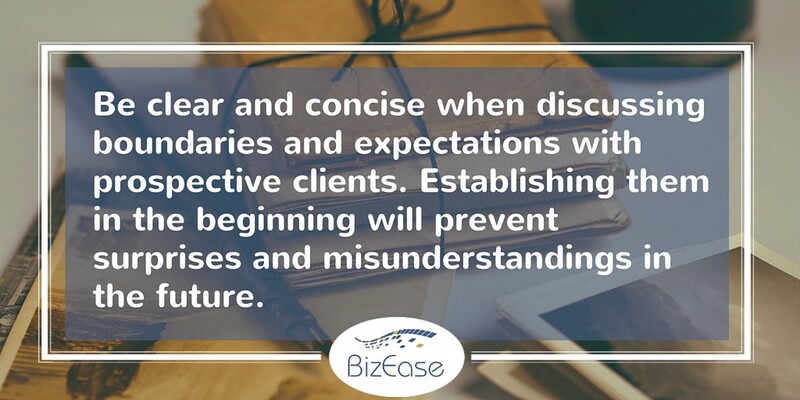 Discussing boundaries and expectations before signing on a new client will prevent issues down the road. If the client knows ahead of time that you and those on your staff/team aren’t available on the weekends or holidays, it won’t be a surprise to them when you don’t respond to emails during those times. If they know ahead of time that your office hours are between the hours of 9 am — 4:30 pm ET, they won’t be surprised when you don’t respond right away to an email sent at 6 pm, or when you don’t answer the phone at 7 pm. Setting boundaries regarding how long it will take to provide a service or complete a task, what method of payment you accept and when payment is expected, who to call in case of an emergency, and other expectations regarding how you run your specific business will prevent surprises and misunderstandings in your relationship with your clients. Have you established specific boundaries for your business? Do you discuss these boundaries when you are in the discovery stage of signing on a client? Are these boundaries in written form in addition to being a part of a verbal discussion? Do you enforce these boundaries if and when a client butts up against them? If you can say yes to all of these questions, then you’re on the right road to a smooth business relationship. If not, it’s not too late to change things. What kind of boundaries have you established for your business? Leave a comment below and let me know what boundaries you feel are most important in your own business.